Hello from sunny Florida! We made the 14.5 hour drive to Cocoa Beach with my in-laws Saturday, just in time to escape more snow in the Midwest. While most of our time here will be spent in Cocoa Beach, we headed to Orlando for a couple of days to check out theme parks. 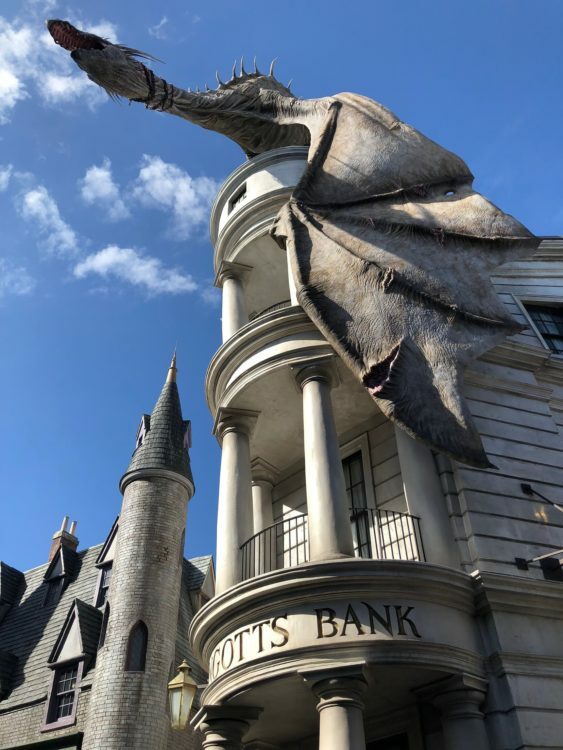 Our week started with a day at Universal Studios, which none of us had visited before. 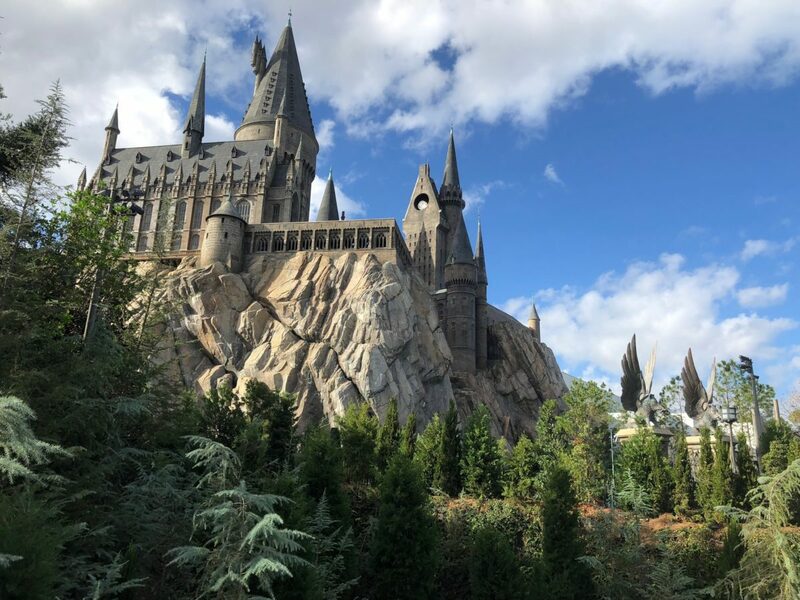 I’ve been dying to go and check out the Wizarding World of Harry Potter, and it lived up to all the hype. 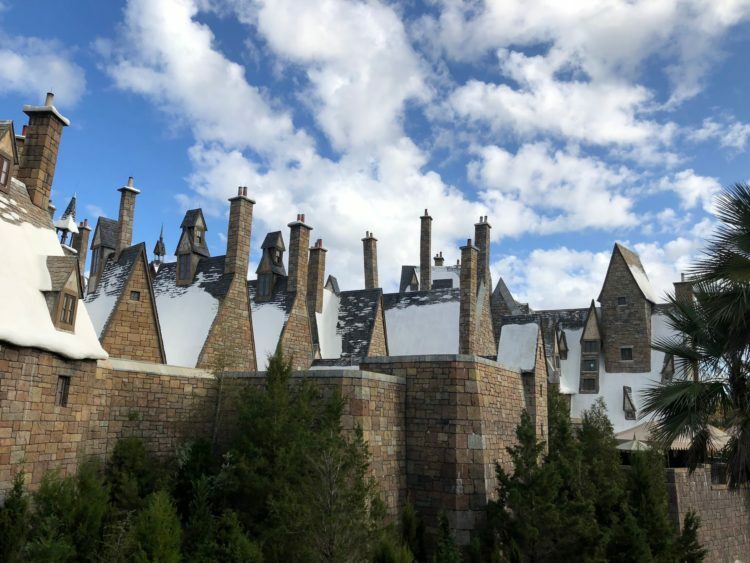 We headed straight for Hogsmeade when we got into the park. It was cooler than normal for this time of year in Florida, which worked to our advantage. The crowds were relatively small when the park opened. So, James and I got on to Harry Potter and the Forbidden Journey right away. It ended up being my favorite ride of the entire week! You walk through Hogwarts to get to the ride, and all of the detail put into the castle is absolutely amazing. Then, you get strapped in to go on a magical ride throughout the Hogwarts grounds with Harry. The ride combines video elements, animatronics and motion for a real thrill. 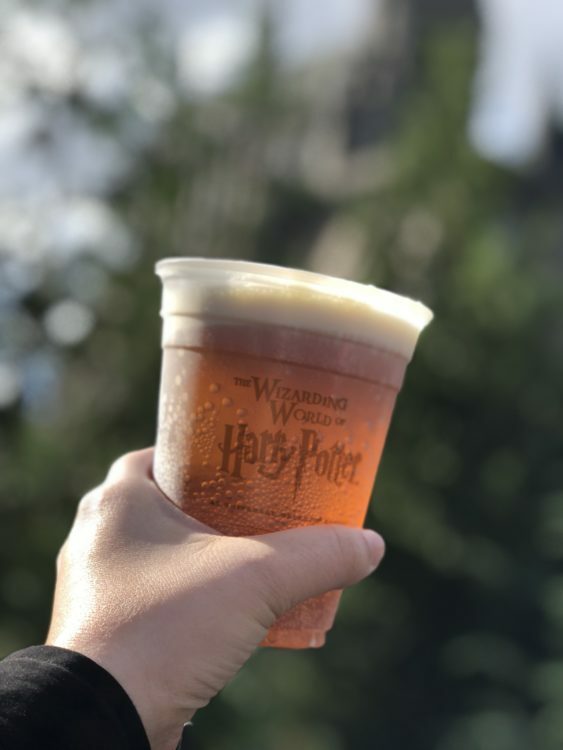 We, of course, couldn’t resist grabbing a butterbeer when we got off the ride. They offer it as a soda, frozen or hot. We went for the classic soda version, which tastes similar to cream soda. It’s topped with a frothy, butterscotch cream. We sipped our drinks as we wandered through Hogsmeade and checked out a few shops. You can buy just about everything from the books, from wands to chocolate frogs. We couldn’t resist picking up a couple of chocolate wands for some friends. Next, we hopped on the Hogwarts Express to head over to Diagon Alley. 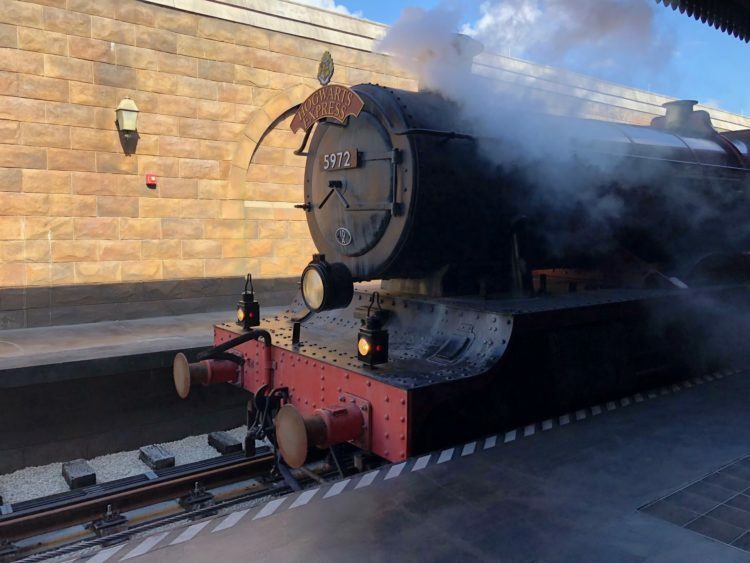 In order to ride the train and see all of Harry Potter World, you need a park-2-park pass, because the attractions are spread out over two parks. Like all of the rides in Harry Potter world, the train ride was magical. The ride is also different each time if you ride it both ways! We stepped outside into the streets of London, and ducked into Diagon Alley. This area of Harry Potter world is also full of shops and restaurants inspired by the books. There’s a Race Through Gringotts ride, which is extremely popular. The wait was 1.5 hours, so we decided to grab lunch at the Leaky Cauldron before heading to check out the rest of the park. I wasn’t allowed to watch The Simpsons growing up, but a large part of the park is dedicated to the long-running show. This section of the park is setup like Springfield, the town where the show is set. There are several rides, as well as famous food from the show. 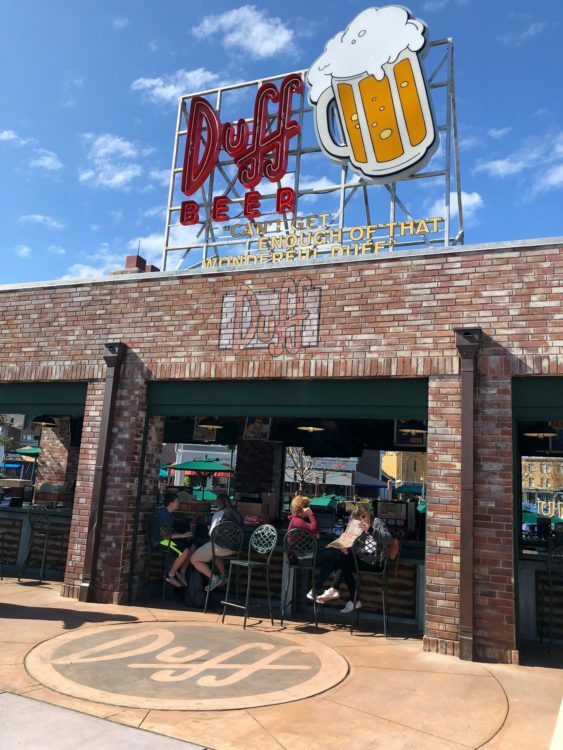 We couldn’t resist trying Duff beer and a giant Lard Lad donut. I was constantly amazed by all of the detail put into each area of the park. We went on a few more rides before taking the Hogwarts Express back to Islands of Adventure. We kept hopping on rides until about 5 p.m. there, when we decided to call it a day. We stopped for a treat at the Toothsome Chocolate Emporium on our way out of the park. If you have a sweet tooth, you MUST stop here. The restaurant has everything from specialty chocolates and macarons, to the most insane milkshakes I’ve ever seen. James and I split and peanut butter and jelly shake, which came topped with half a sandwich and a cupcake. 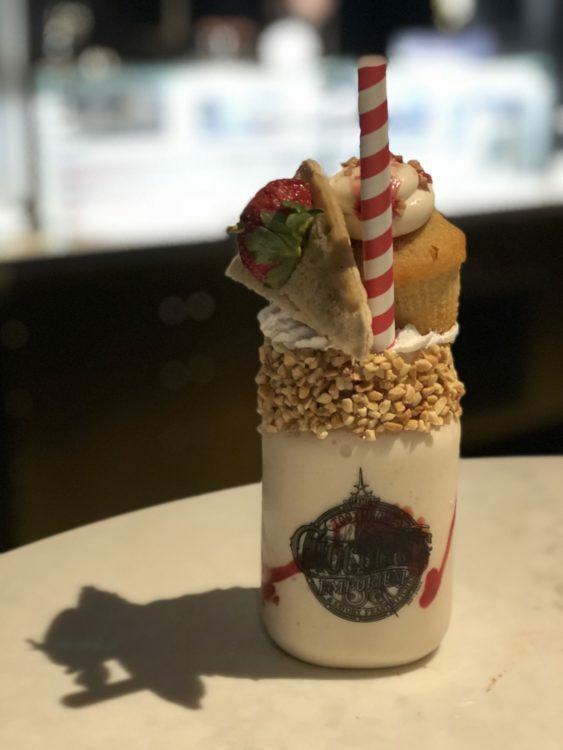 It was a meal in itself, and I’ll be dreaming about that shake for a while. We had a blast at Universal, and I would definitely go back. We lucked out with minimal crowds, and were able to do almost everything we wanted at the park in one day. I’ll be back later this weekend with another recap from our day at Disney!